Get ready for the hottest piping product release of 2017 with the new Blair Digital Chanter, due to take the piping world by storm when it is officially launched next month. The Melbourne-based Australian bagpipe electronics specialist Murray Blair of Blair Digital Bagpipes & Tuners, a renowned perfectionist in the development of industry-leading digital applications and devices for the Great Highland Bagpipe, has unveiled the next generation in electronic bagpipes with this new feature-packed Blair Digital Chanter. At first glance, the Blair Digital Chanter looks and feels exactly like a high-end practice chanter with real holes. It’s not until you pay closer attention to the large OLED screen beautifully recessed into the top section that you realise you have in your hands something very special indeed. Billed as offering ‘endless possibilities’, the Blair Digital Chanter has three default bagpipes to choose from; Great Highland Bagpipes, Smallpipes and practice chanter. All sounds are 100% real, professionally recorded and studio quality by Murray Blair himself. The chanter is also fully-updatable and expandable to add more bagpipe sounds in the future via USB connection. Everything is controlled by a single navigation button next to the screen, which makes it so easy to operate. A built-in rechargeable battery eliminates bulky battery ports and additional cost. And then there are the hand-engraved mounts because it has to look good. 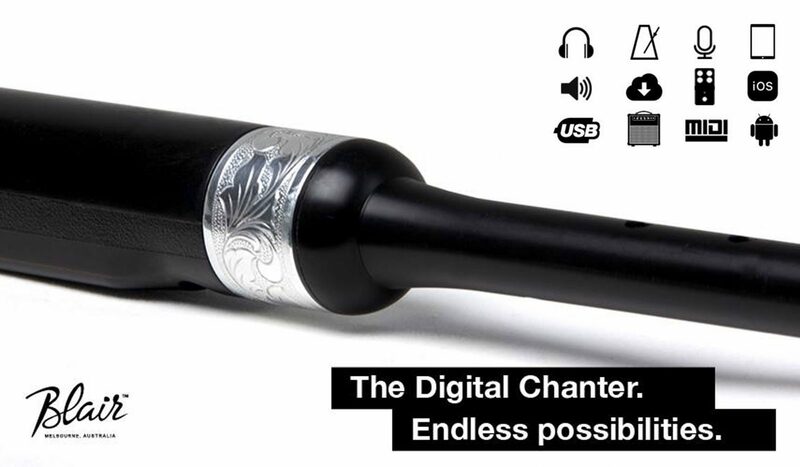 Where the Blair Digital Chanter really stands out from the crowd is in its connectivity and usability. Featuring MIDI output, USB, 3.5mm audio output and PC, iOS and digital tablet connectivity, the possibilities for playback and recording really are endless as described. Compatibility with acoustic amplifiers and speakers, Guitar FX pedals and Amplitube, and integration with apps such as Garageband, Logic and Ableton open the door to the Blair Digital Chanter becoming a staple feature of live performances and studio recordings. But it’s the device’s unique ability for its operating system to be updated and expanded that signifies the product is future-proof and here to stay. The Blair Digital Chanter is raising a lot of eyebrows and rightly so. Stay posted for further information and pricing coming soon.